Pluto's complex geology just got a little less mysterious thanks to two incredible new photos from NASA's New Horizons spacecraft. The probe flew by Pluto on July 14, taking detailed photos and measurements of the dwarf planet as it passed and transmitting them back to Earth. 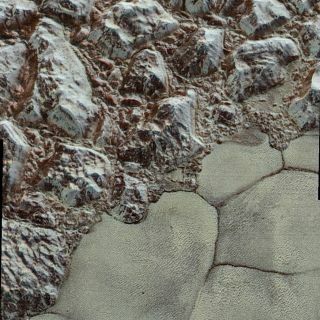 The first new photo, released by NASA last week, spans a region 50 miles (80 kilometers) wide and combines two of the sharpest images yet from New Horizons into a breathtaking, colorized close-up of the dwarf planet's terrain. The al-Idrisi mountains, made of water ice — some of which stand more than 1.5 miles (2.4 km) high — fill the top of the frame. The smooth, icy plane of Pluto's heart, informally named Tombaugh Regio, sweeps in from the lower-right corner. Scientists created the colorized image using a set of photos taken by New Horizons over the course of its closest approach to Pluto during the flyby. The base photo is a black-and-white high-resolution (about 250 to 280 feet, or 77 to 85 meters, per pixel) image taken by the spacecraft's telescopic Long Range Reconnaissance Imager (LORRI) 15 minutes before the spacecraft reached its destination. The photo reveals features smaller than half a city block on Pluto's surface. That image was later combined with low-resolution (about 2,066 feet, or 630 m, per pixel) color data taken by the Ralph/Multispectral Visible Imaging Camera 25 minutes prior to the LORRI pictures, NASA officials said in a statement. The image on the right shows a close-up of intricate pits across Pluto's heart-shaped Tombaugh Regio. It was taken by New Horizons' Long Range Reconnaissance Imager (LORRI) as the craft passed just 9,550 miles (15,400 kilometers) from the dwarf planet's surface in July. Because there are only a few impact craters on top of the pits, scientists can now see that these mysterious indentations, which are usually hundreds of yards across and tens of yards deep, formed relatively recently. Researchers think these indentations developed as liquid flowed through the terrain, turned to ice, fractured the ground and then evaporated. The image shows another 50-mile-wide region on the border between the giant ice sheet called Sputnik Planum and the pitted area. A series of hills surround the shoreline, and the two rings — which NASA officials say could be the remnants of two craters — sit in the bottom-left and right-hand corners. New Horizons has shared many dazzling views of Pluto taken during its closest approach, but more will follow — the spacecraft's slow transmission speed means scientists will be receiving data about the dwarf planet for the next several months as the craft continues outward.